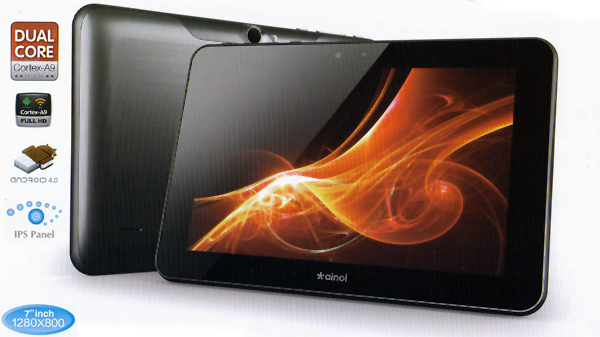 July 27, 2012, San Jose, CA, USA Ainol has confirmed that they started the pilot production of its upcoming top-end flagship tablet NOVO 7 Burning this week, and they are on schedule to release it on the August 15th. Ainol Novo 7 Burning is the newest and the only 7″ tablet with 1280×800 pixel 180 degree viewing angle IPS capacitive screen (same screen as the Google Nexus 7 ) and runs Android 4 .0.3 Ice Cream Sandwich . NOVO 7 Burning is powered by a 1.5GHz AMLogic ARM 2nd generation Cortex-A9 based dual-core CPU. It has dual-camera – 2MP front facing webcam and 5MP rear facing camera. NOVO 7 Burning has HDMI port to let you play video on your big screen HD TV. It is the only one with ultra-thin metal case in all Ainol tablet models. Ainol NOVO 7 Burning has Google Play (Android Market) pre-installed. Since Ainol NOVO 7 Burning is released about the same time as Google’s own Nexus 7 , people are comparing those two tablets . Many customers who pre-ordered Ainol NOVO 7 Burning shared with us the reasons they picked NOVO 7 Burning instead of Google Nexus 7 . Here is the summary: NOVO 7 Burning has the similar spec and built quality as Google Nexus 7 . Although Google Nexus 7 has a more powerful CPU and bluetooth , but Ainol NOVO 7 has a few nice features that Nexus doesn’t have. For example, the expandable memory, HDMI port to output HD video to your big screen TV, 5MP rear facing camera, and metal case . In addition, Google Nexus 7 doesn’t support FLASH any more, while Ainol NOVO 7 Burning has a hardware rendering FLASH, super fast and smooth. NOVO 7 Burning 16GB version ($179.99) is $70 cheaper than Google Nexus 7 16GB version($249.99). In some sense, Google Nexus 7 is designed for Google – they want you to use their cloud computing service to store your information and files, you can watch YouTube in their app, but you won’t be able to watch any other FLASH video sites, while Ainol NOVO 7 Burning is design for you – it allows you to add expandable memory when needed, shoot 5MP pictures, watch FLASH with hardware rendering, and to share your video with your family on big screen TVs. And most importantly, save you money. As Ainol’s oversea distributor , uPlay Tablet will get the first batch of NOVO 7 Burning. We are taking pre-order on our Ainol NOVO 7 Burning product page for only $179.99. The supply of Ainol NOVO 7 Burning will be tight at the beginning. We will follow the order of orders strictly. Order now to ensure you get one from our first batch. You can cancel your order any time before we ship.